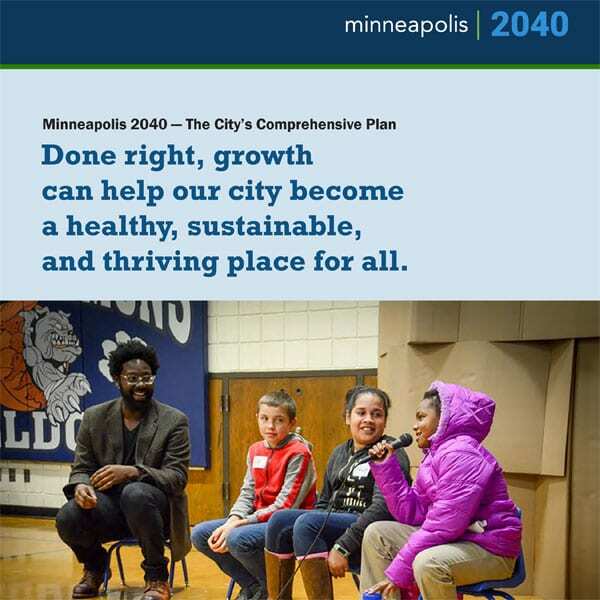 Earlier this month, Minneapolis, writes Henry Grabar in Slate, became “the first major US city to end single-family home zoning, a policy that has done as much as any to entrench segregation, high housing costs, and sprawl.” The comprehensive plan, passed by City Council on a 12–1 vote, is called Minneapolis 2040 and, as Grabar explains, aims to “permit three-family homes in the city’s residential neighborhoods, abolish parking minimums for all new construction, and allow high-density buildings along transit corridors.” There are still some hoops at the regional and state level to go through, but the plan is expected to take effect by the middle of next year. The ubiquitous R-1 zoning—R-1 meaning “single-family residential”—may seem neutral but has actually been a tool used to promote segregated neighborhoods. As Grabar explains, single-family home zoning was devised as a legal way to keep Blacks and other people of color from moving into certain neighborhoods. “It still functions as an effective barrier today,” Grabar adds. According to Minneapolis Mayor Jacob Frey, the city is abolishing restrictive zoning to begin to reverse the damage wrought by over a century of segregation. The US Supreme Court struck down race-based zoning in 1917 in Buchanan v. Warley. But the decision was quickly circumvented through such means as race-based exclusionary housing covenants (because the covenants were private documents, not based on state action like zoning is, such discriminatory documents remained legal until the Fair Housing Act of 1968). But a zoning loophole was also found. In 1926, in Village of Euclid v. Ambler Realty Company, the US Supreme Court upheld the City of Euclid’s use of zoning to ban apartment buildings. Interestingly, Mayor Frey is a renter himself—“maybe the first tenant-mayor in the history of a city,” writes Grabar, in a city where, like most US cities, the majority of people are renters. Despite the mayor’s support, approval was not without controversy. Residents submitted 7,000 comments on the draft plan. According to Paula Pentel, coordinator of the University of Minnesota’s urban studies program, three factors helped to get the zoning change passed through city council, 1) the election of a progressive city council dedicated to creating more housing, 2) the mobilization and advocacy of pro-zoning reform groups, and 3) extensive public outreach. Nick Magrino, who sits on the city’s planning commission, notes that the fact that a new zoning code requires time to have an impact (since it affects new building, not existing building) probably lessened homeowner resistance to change. An influx of younger, more affluent urbanites into formerly low-income neighborhoods, using affordable housing preservation as an anti-gentrification tool, can create inclusion if low-income households are not displaced by speculation and rent increases. This is a new strategy niche.